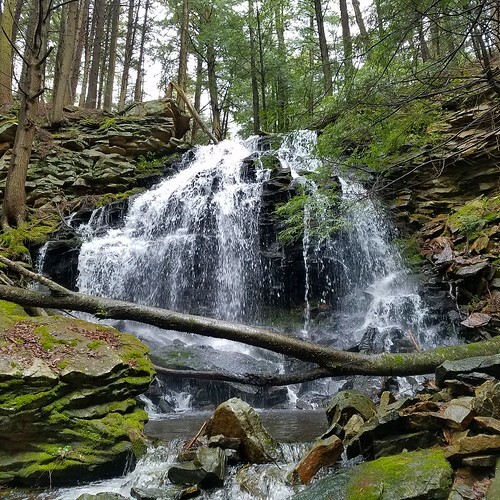 One of the Loyalsock State Forest’s best kept secrets is Tamarack Falls. 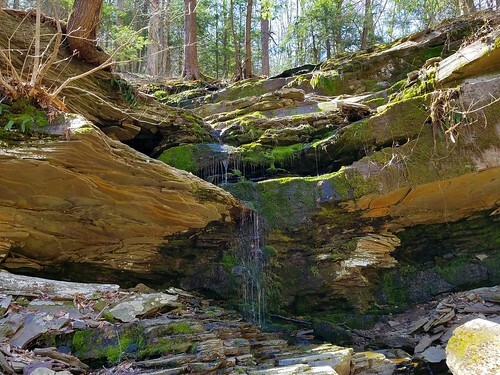 In my opinion, it is one of the most scenic falls in the state forest due to its beautiful hemlock shaded grotto with fractured cliffs and cascades. It really feels like a place set apart. I parked along Loyalsock Road where it crosses Tamarack Run. From there it was an off trail hike south (or downstream) along the creek. 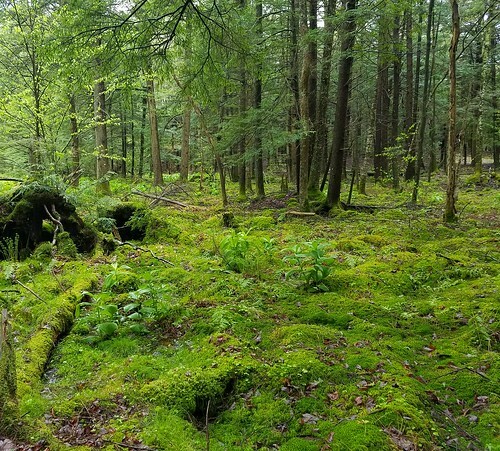 The terrain is rocky, but the scenery is simply breathtaking with bogs, hemlocks, and deep green carpets of moss. I crossed a gated forest road and continued along the creek, as it tumbled among moss covered rocks between boggy areas. I then entered the top of the gorge and I soon reached the top of Tamarack Falls. It is best to see and approach the falls from the east side, or left if descending along the creek. 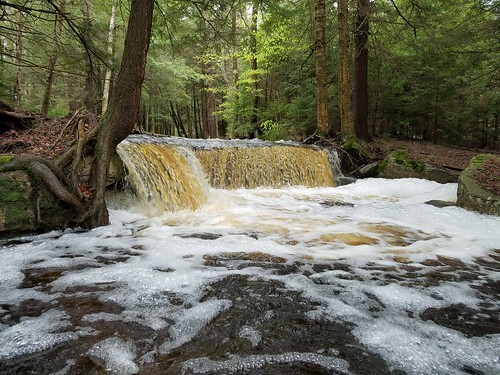 There is a stunning hemlock grotto with rapids and cascades below the falls. Be careful descending to the creek and be sure to hike around the cliff rim. The cliff is fractured and features a small cave. Be careful of the loose rock along the creek. The scenery is simply stunning. The falls is about 20-25 feet tall and widens as the water drops. Ledges and boulders large crown the glen. Cascades continue below the falls and out of the glen. 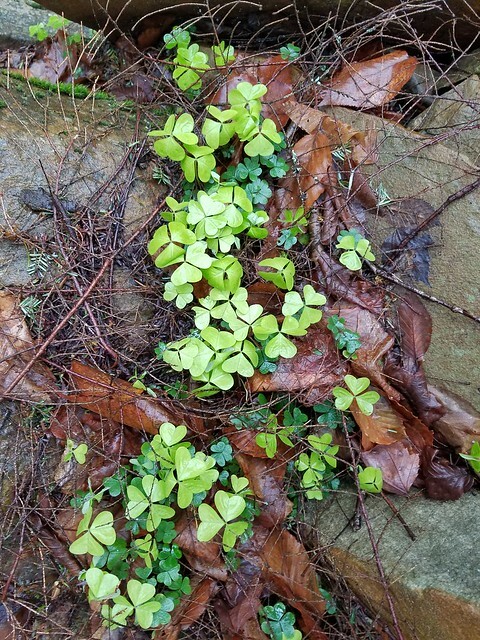 There is also an old grade at the bottom of the glen. Afterwards I stopped by Sones Pond and continued north to PA 87. 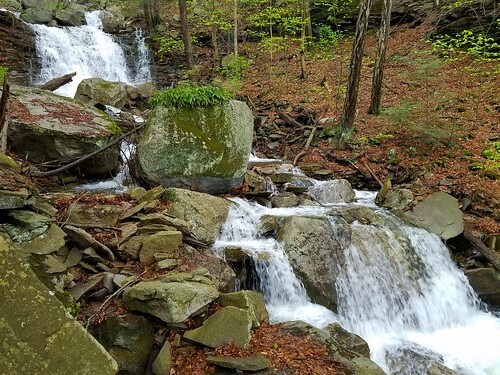 Along Rock Run Road I saw some beautiful seasonal falls on the left. I suspect some other streams in this gorge may also have waterfalls, but that will be an exploration for another day. Want more waterfalls? 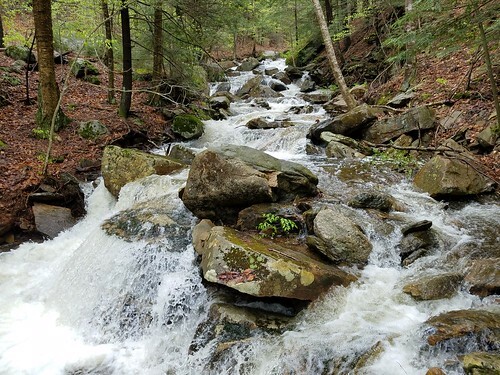 Nearby is Coal Run, the outlet of Sones Pond, which has three or four off trail falls. Hiking to Tamarack Falls is easy, but off trail. Hike south along Tamarack Run for about .75 of a mile. Reach the top of Tamarack Falls, go on the left or east side. Descend carefully, hiking around the ledges at the top. 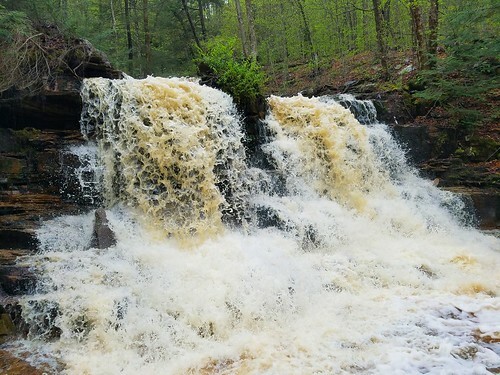 Tamarack Falls are at N 41 28.094 W 76 31.880. Walk to the right, counterclockwise, around deer fence. Leave deer fence when you hear the sound of a falls, descend to the creek. 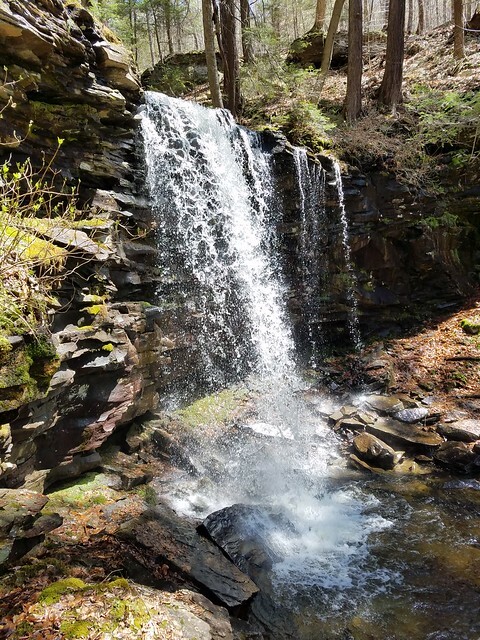 Hike to the above coordinates for Tamarack Falls. 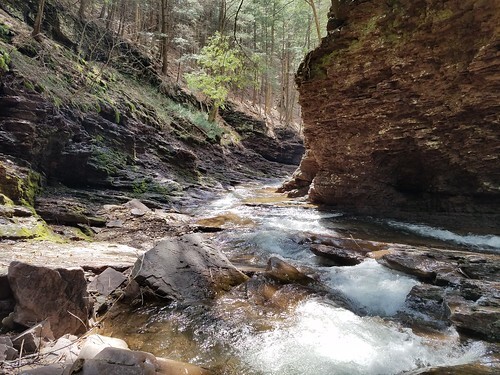 Located north of the more well-known Ketchum Run Gorge, Scar Run Gorge is one of the Loyalsock State Forest’s hidden jewels. 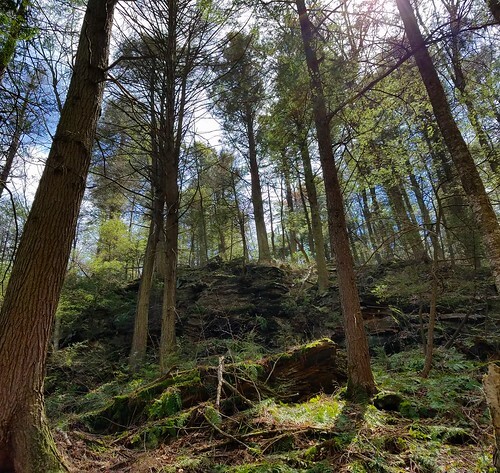 My goal was actually to see a pine forest north of the gorge, but I ended up hiking Scar Run as well. I parked off of Coal Mine Road where it meets the gated Randall Road. I followed the gated road and its yellow and blue blazes. At a Y, I followed the road to the left, leaving the blazed trail to the right. This road went through a series of four deer fences and ended at the edge of the pine forest. From here, it was off trail hiking. 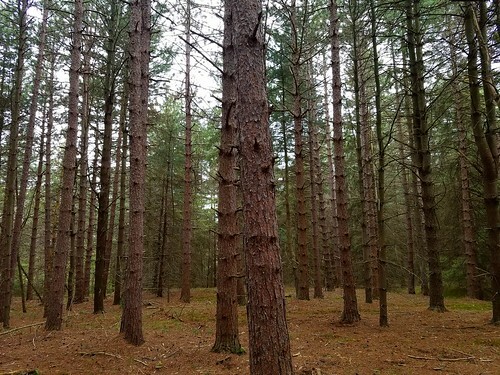 The pine forest was quite beautiful, comprised mostly of red pine with some spruce, white pine, and random apple trees. It had a dark, haunting quality to it, and would be a beautiful place to visit after a snowfall. A small, marshy pond was embedded in the forest. The ground was carpeted with thick layers of needles. The southern part of the pine forest was at a lower elevation and featured thick white pine. Pine forests of this size are rare in the area; this one covers roughly 80-100 acres. I hiked to the edge of the plateau to see meadow areas with thousands of mayapples growing. I was going to retrace my steps, but then thought, why not return along Scar Run? So I bushwhacked down to Scar Run, following some old grades. 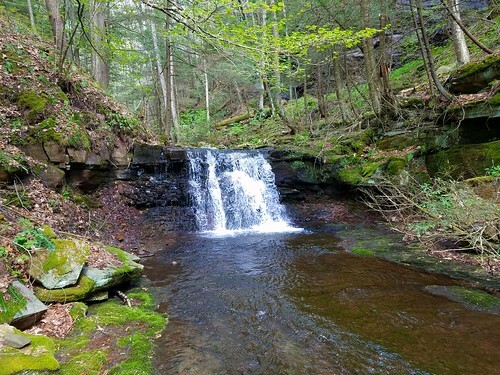 Scar Run is a stream of great beauty, featuring many waterfalls, pools, and green moss grottos. It is described in Hike No. 42 of Hiking the Endless Mountains. An old grade started on the south side of the creek, but then crossed to the north. A variety of wildflowers were growing. 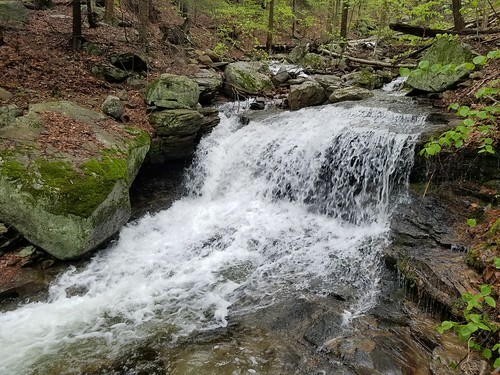 The grade is close to many of the falls, offering fine views of the scenic creek. In some places, the grade is washed out. I was particularly happy to see trout in Scar Run. Ledges glistened with springs as large trees towered above ferns. Moss seemed to cover everything near the creek, creating a ribbon of emerald. The old grade crossed the creek with more waterfalls to the left. I simply followed the grade back to Randall Road and my car along Coal Mine Road. Afterwards I drove down Coal Mine Road to the Loyalsock Trail and hiked out to Alpine Vista. 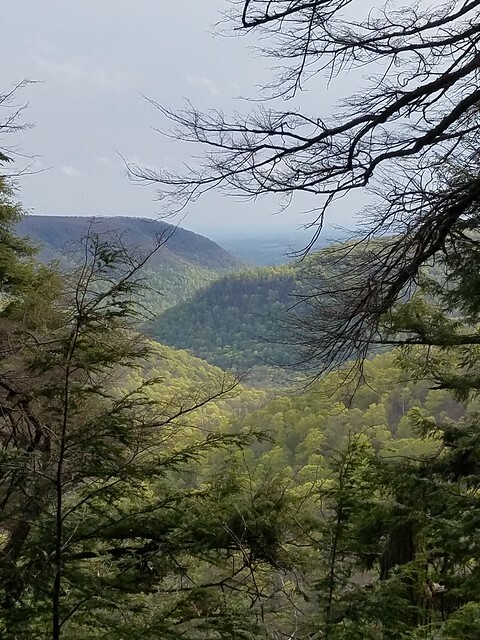 The view was beautiful as shafts of sunlight penetrated the brooding clouds to the fresh leaves of the fluorescent forest below. 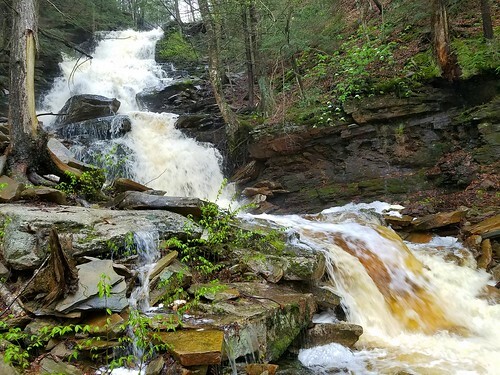 If you love waterfalls, check out Scar Run. Hiking Scar Run is fairly easy. All GPS coordinates from Google Earth. Follow this obvious road, which becomes more brushy through a series of 4 deer fences. Want to just see Scar Run and its waterfalls? Go to the old grade at 41°27’50.76″N 76°36’39.28″W. 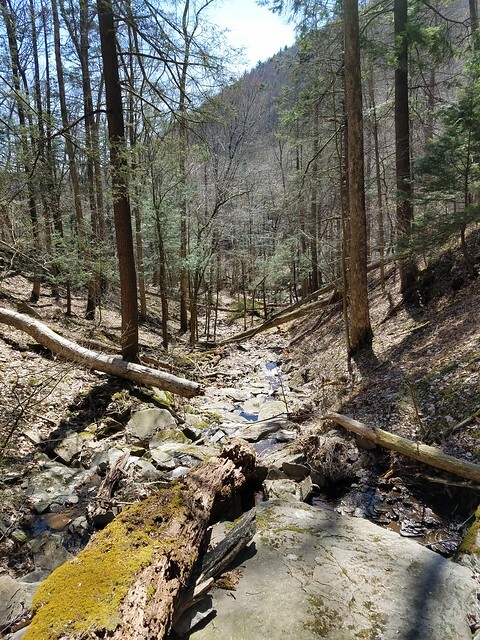 Hike the grade down to Scar Run. Scar Run has lots of stinging nettle in summer. Do not attempt in high water. 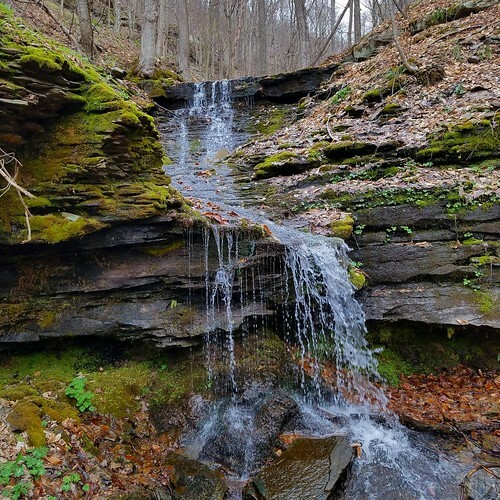 As many of you know, the Waterfall Wonderland in SGL 13 is a place of amazing natural beauty. I love it for not only its waterfalls, but also its isolation, deep gorges, and large trees. 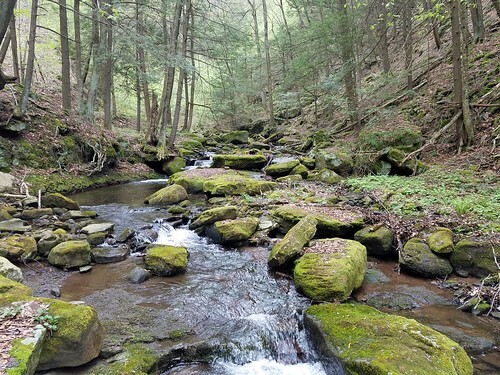 I returned a few weeks ago to explore two tributaries of Sullivan Branch-Hunts Run and Pigeon Run. 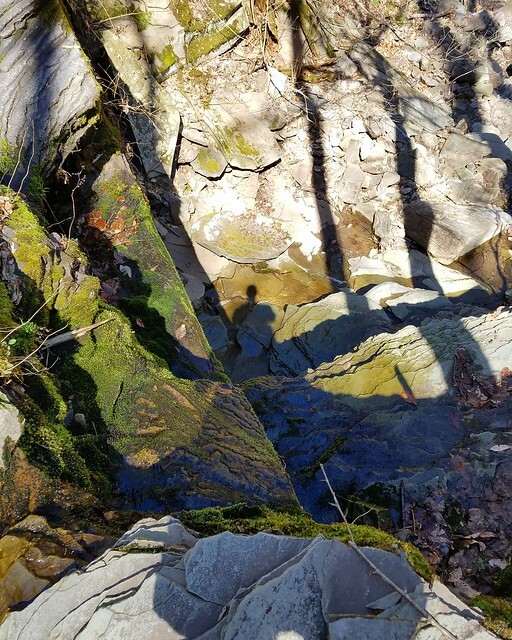 I explored each tributary on separate hikes. 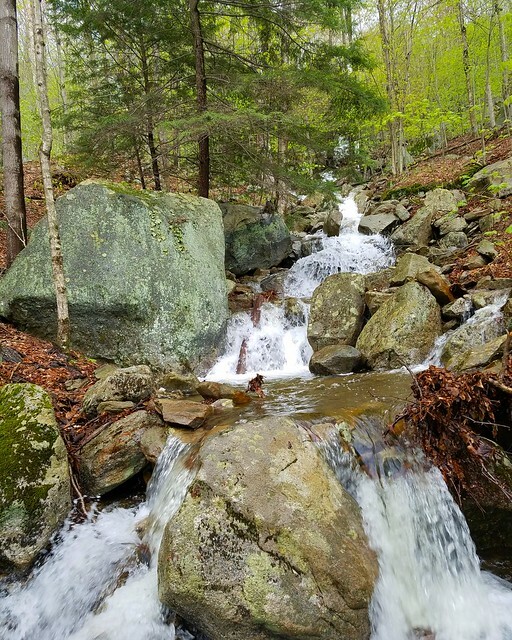 First I hiked to Hunts Run. 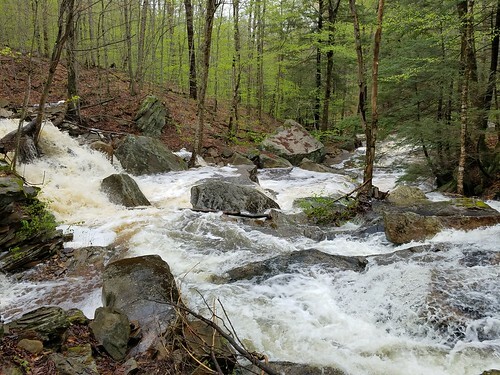 Thanks to recent rains, Sullivan Branch and Sullivan Falls were flowing high. I made my way up Sullivan Branch, enjoying the gorge, rapids, and cascades. 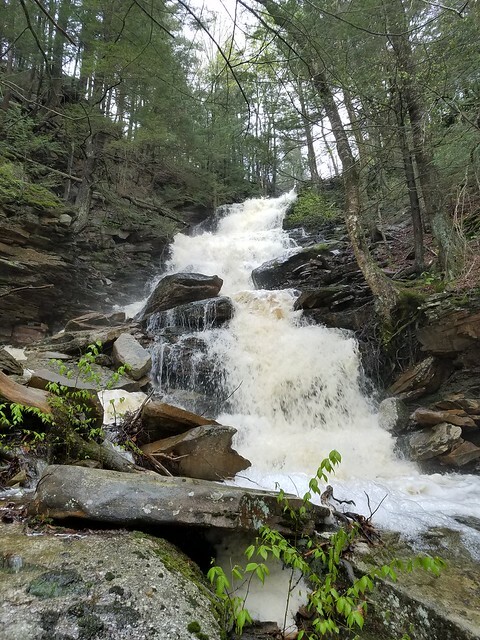 I saw Pigeon Run Falls with its plummeting sheet of water and continued up the creek, enjoying all the falls and deep pools. 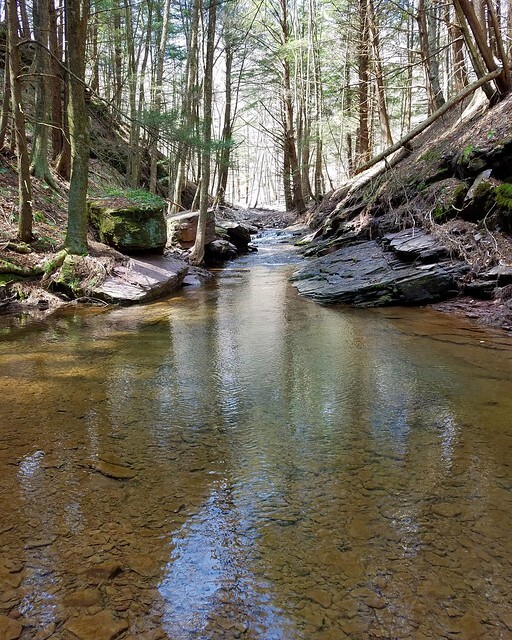 I crossed Sullivan Branch and hiked up the slope, reaching an old grade that brought me to Hunts Run. 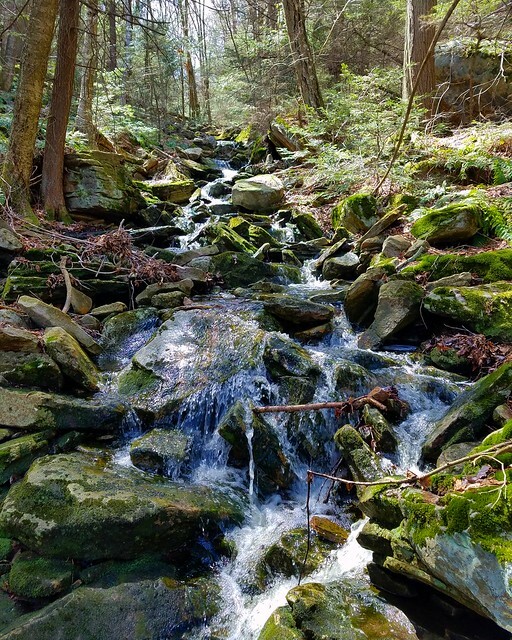 The hike up Hunts Run was scenic, but there were no waterfalls, just non-stop cascades over mossy boulders. This glen was scenic and isolated. At the top I explored some large cliffs and overhangs. 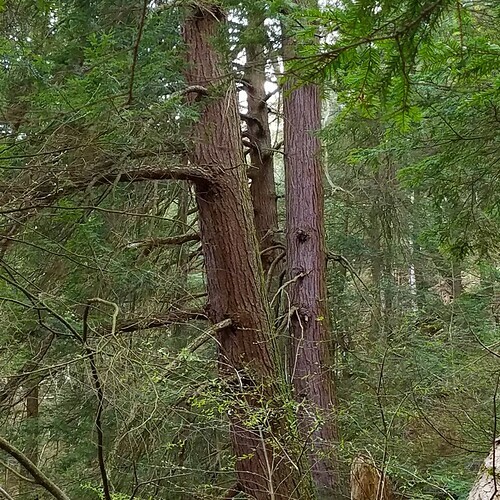 What was most impressive was a forest of old growth hemlocks, with many large trees. I then made my way back down to Sullivan Branch, and returned to my car. 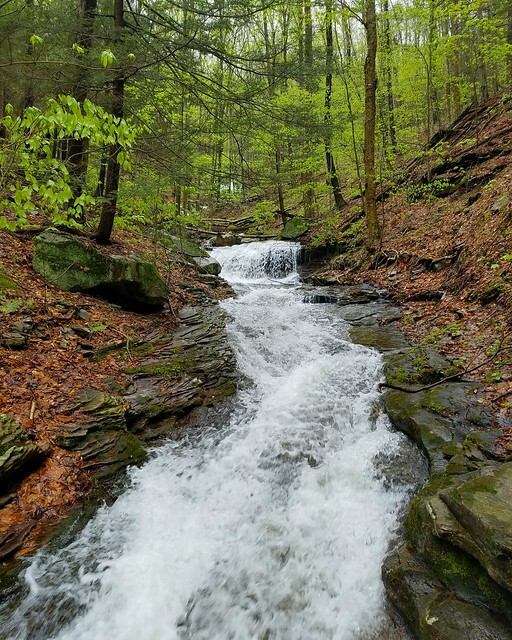 My second hike took me up Pigeon Run, a stream well known for all its waterfalls. This hike did not disappoint. This creek had five or six waterfalls in beautiful grottos and overhanging ledges. 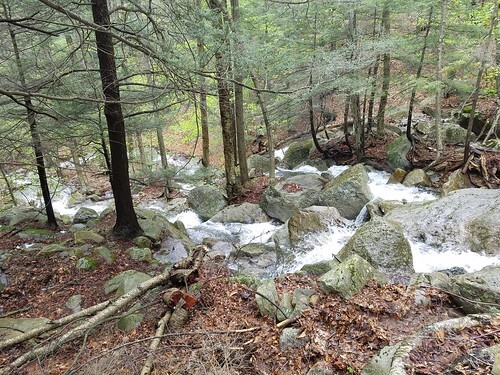 The last falls was a slide that spread out like a fan, just below a private property line. Pigeon Run became a gauntlet of steep boulders and more cascades in a very rugged glen. 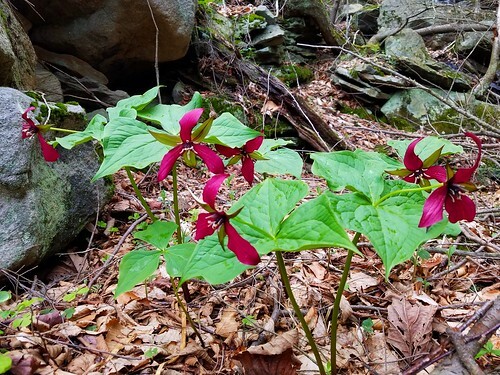 Many trilliums grew on the boulders. 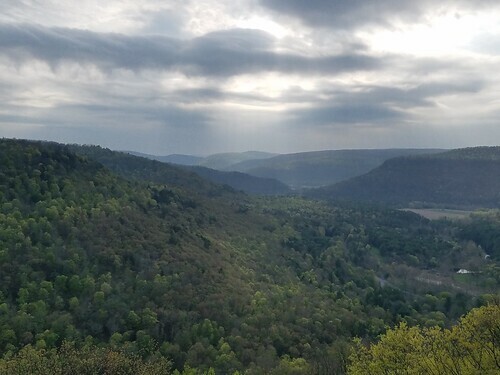 I followed the game lands boundary to a stunning place at the top of the gorge. 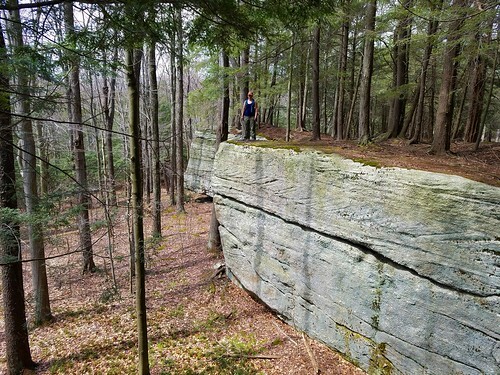 Massive, ancient hemlocks surrounded this place, as cliffs and ledges rose over me. At the top was a beautiful 40ish foot falls that tumbled down three or four drops. 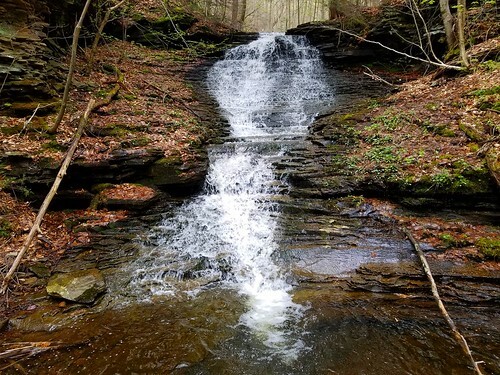 I called it the Falls of the Hemlocks, located at N41 20.815 W 076 19.825. This felt like a wild, primeval place. I followed the cliff rim west, back to Sullivan Branch. This was a beautiful place with large cliffs crowned with more large hemlocks. There were views of the gorge below through the trees. 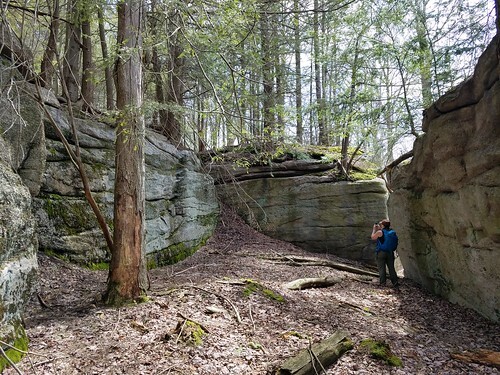 I made my way down the slope, passing boulders and rock outcrops back to the unblazed trail above Sullivan Branch, which I took back to my car at Sullivan Falls. 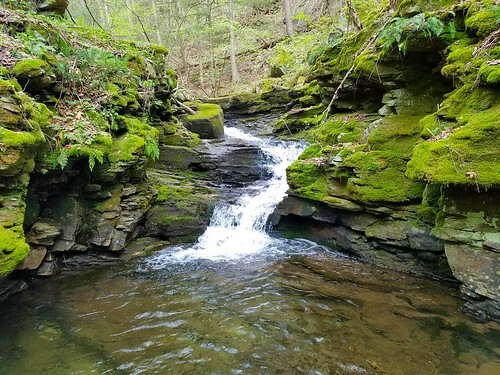 South of Shunk, just within the Loyalsock State Forest, is a place of great beauty that is fairly easy to reach and that few know even exists. 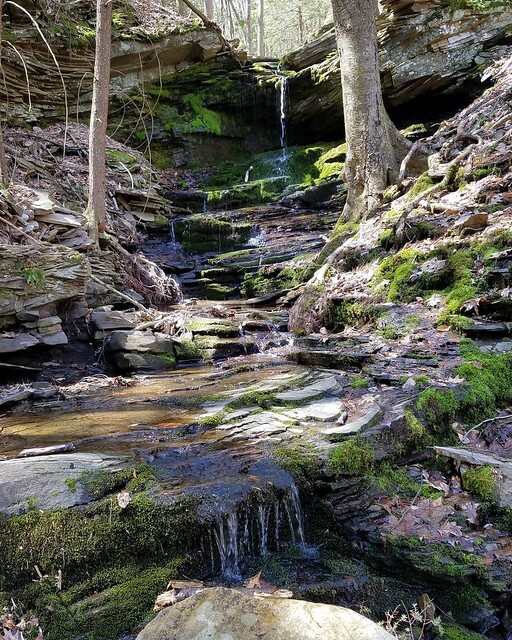 Weed Creek and Hoagland Branch join among waterfalls, chasms, gorges, deep pools, and rapids. Hemlocks shroud this special place. I call it the Hoagland Chasm and Weed Falls. I parked along the road where Bear Wallow Road meets Dry Run Road. I then hiked an obvious, gated old grade to the north as it curved through drainages and then began a long, gradual descent to Slaskey Run. I noticed a faint footpath on the grade. 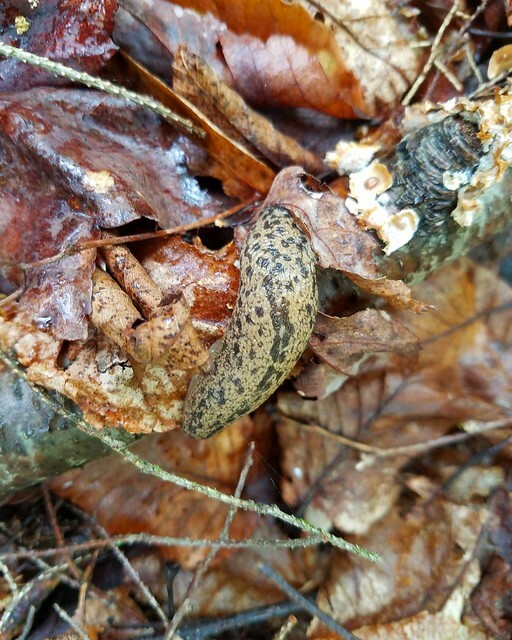 The forest was beautiful with many large hardwoods and countless spring wildflowers, not to mention many large areas of ramps. At Slaskey Run there was a private property line so I followed an obvious grade to the right as it continued a gradual descent. Below Slaskey Run tumbled over small waterfalls and slides. The largest falls is about 7 feet tall. As I neared Weed Creek, another grade was to the left. I took it. It followed the top of Weed Creek’s gorge and then descended to the water. From here, I walked in and along the creeks. 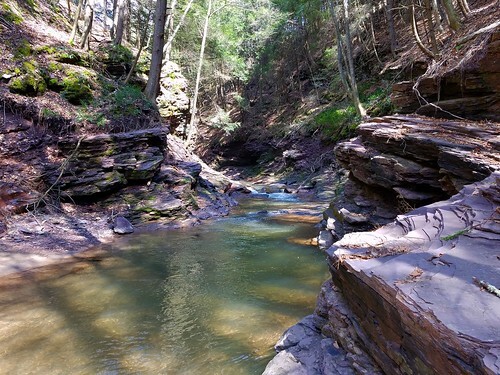 Weed Creek promptly entered a hemlock shaded gorge with steep slopes and ledges. The creek danced down slides and rapids with deep pools. It was very beautiful. The gorge opened up and I soon found myself on the top of Weed Falls, a scenic, curving 30 foot falls. I was able to scrambled down the side of the falls and entered a stunning grotto as cliffs rose around me topped with hemlocks. I continued down Weed Creek with more rapids and slides. I then reached a beautiful sliding cascade where Weed Creek joined Hoagland Branch. The beauty of this spot was amazing with deep translucent pools as cliffs hemmed in Hoagland Branch. 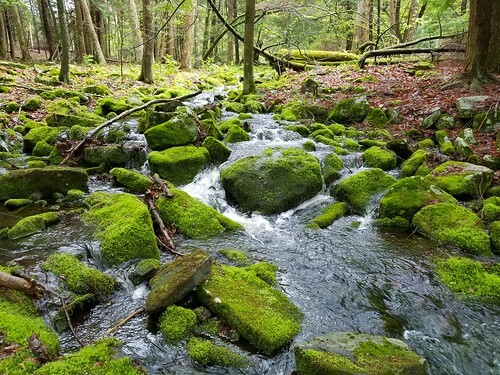 The sounds of the rushing creek echoed against its rocky confines. I was amazed by this place. I turned left and hiked upstream along Hoagland Branch; I was speechless. I entered a spectacular chasm as red rock rose above me with angled buttresses. The creek had carved into the bedrock deep pools and slides. Hemlocks towered overhead. As I hiked up the chasm, the cliffs grew taller, everything was deeper and darker as if I was entering a different realm. There were no waterfalls, but several slides and rapids with deep pools. It rivaled the famous Rock Run. The floods from last Fall had scoured the sides of the chasm along the angled contours of the red bedrock. The northern end of the chasm ended at a private property line. I retraced my steps back to Weed Creek, mesmerized by the scenery. 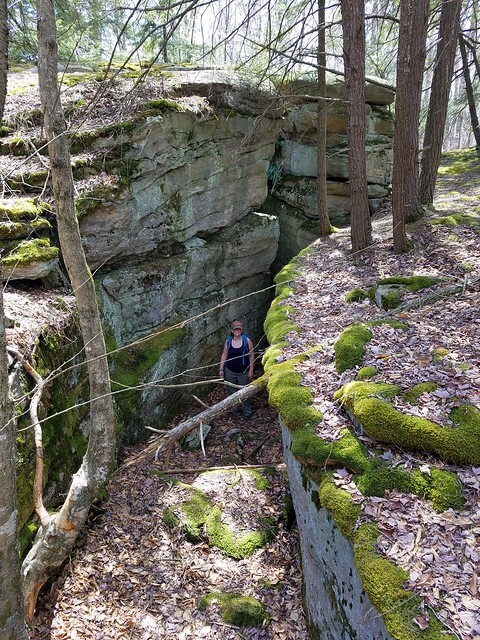 I explored more of Hoagland Branch below Weed Creek to see the deep pools glowing in the bright sun. There were rapids and deep pools. A cabin was further downstream on the left. I saw the state forest boundary and turned around, retracing my steps back to the car. 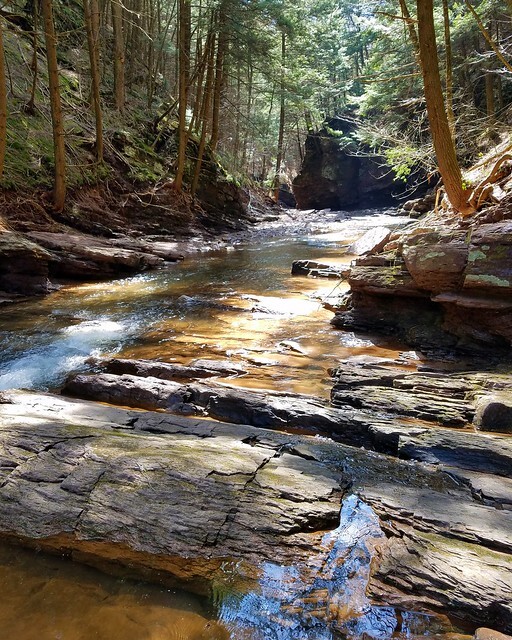 A place of remarkable beauty hidden in the shadows of gorges and hemlocks, I will be back to Weed Falls and the Hoagland Chasm. 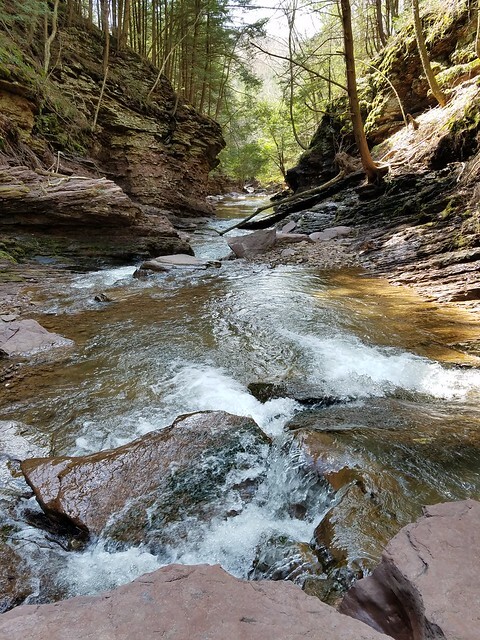 Hiking to Hoagland Chasm and Weed Falls is easy. The grade down to Weed Creek is obvious. There are no marked trails or signs. Park at the juncture of Dry Run Road and Bear Wallow Road. Park along the road, space is limited. 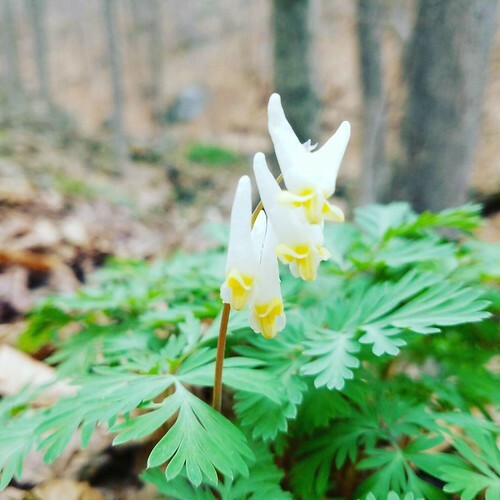 Follow the obvious, gated grade north of the road as it curves and then gradually descends through a beautiful hardwood forest with many spring wildflowers. Reach Slaskey Run and a private property line; turn right onto obvious grade. 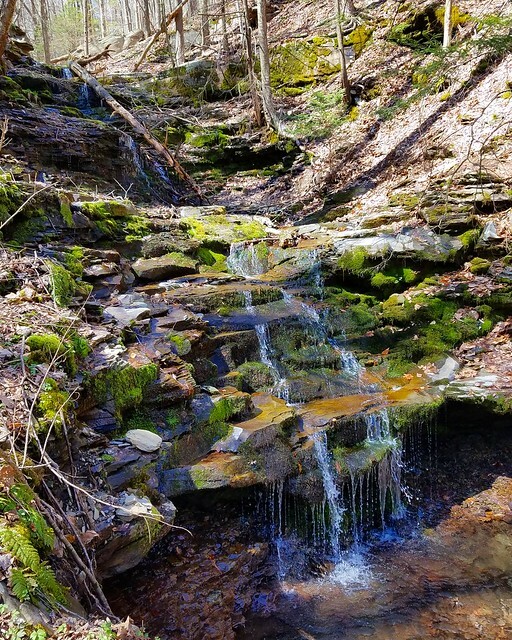 Small waterfalls along Slaskey Run below the grade. As you near Weed Creek, look for a faint grade that curves left. Follow it above Weed Creek Gorge with views of the gorge. Descend to where Weed Creek and Slaskey Run meet. The rest of the hike follows the creeks. You must hike in and along the water. Do not attempt in high water. 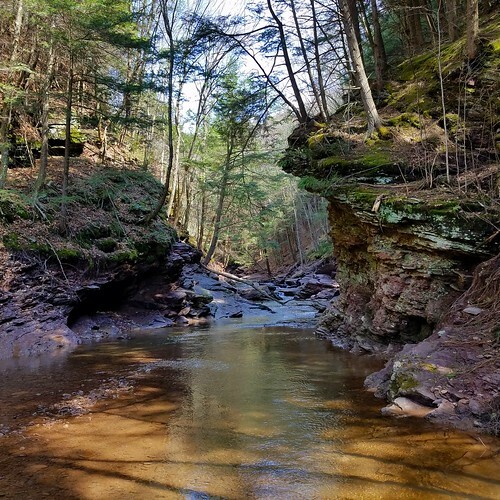 Hike Weed Creek downstream into a beautiful hemlock gorge. Reach the top of Weed Falls. Possible to scramble down north side of the falls, be careful. Otherwise hike around it. Beautiful grotto or gorge below Weed Falls. Reach juncture of Weed Creek and Hoagland Branch at a sliding waterfall. Scenery is superb. 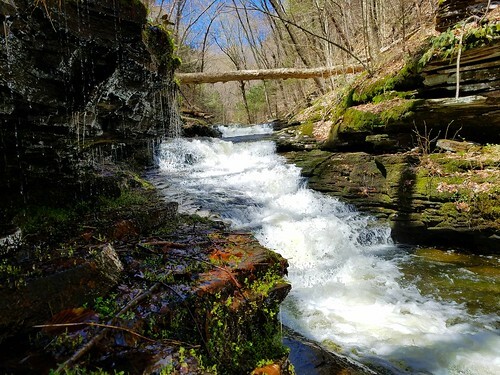 Turn left and hike Hoagland Branch upstream into the stunning chasm. Chasm is about 1,000 feet long and ends at a private property line. Be careful hiking in the chasm and watch for the deep pools. Again, never attempt in high water. Please treat this special place with respect. Hike is about 1.5-2 miles, one way. We returned to Worlds End for some dayhiking. 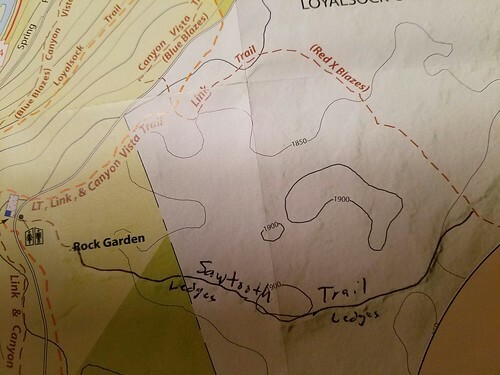 Our first hike was on the unofficial Sawtooth Trail, which I described previously. This second hike was as enjoyable as the first as the trail explored big rocks, ledges, crevasses, and unique whitish triangular ledges. This is truly a beautiful trail that should be on anyone’s list when they visit the park. We reached the Link Trail and turned left, through hemlock forests and above more ledges. These two trails create a 2-3 mile loop that is easy and very scenic. Please note the Sawtooth Trail is unofficial, it does not have blazes or signs, but it is fairly well established as it explores the top of the ledges. Our second hike began at the park office. 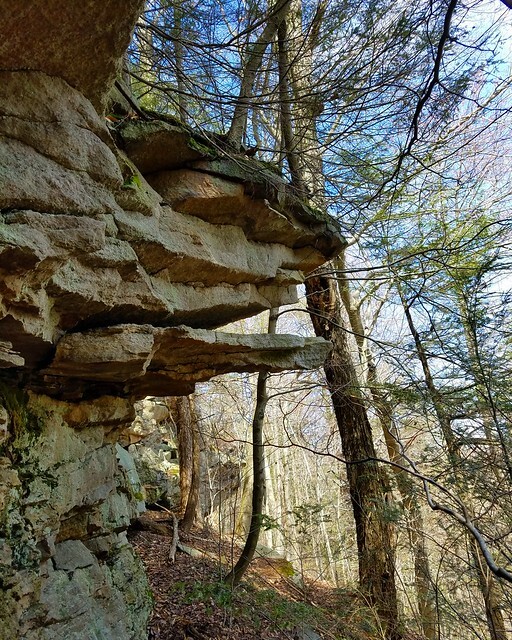 We hiked to the orange blazed Butternut Trail and began the climb up, before turning right on the “lower road” sign as the trail crossed a steep slope with the Loyalsock Creek below. We then entered the scenic glen of the Butternut Run with ledges and many wildflowers. Butternut Run was flowing well as the trail passed above a waterfall. Switchbacks over rocky slopes soon brought us to Butternut Vista with a nice view of the creek and park. 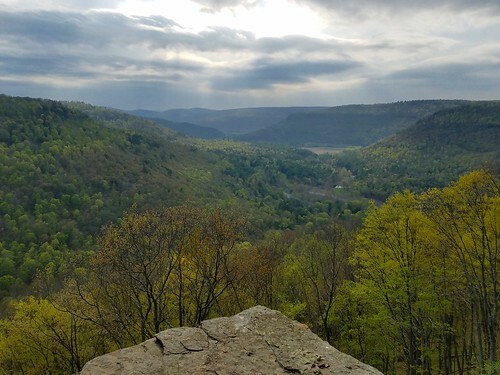 The trail from the vista was level and quite scenic, passing a side trail on the right that went up to Loyalsock Road. The Butternut Trail passed below another falls that was further off trail at the top of the glen and then proceeded through the forest with more fine scenery of big trees and flowers above the deep glen. I really enjoyed this trail. We then reached a yellow trail to the right. This unnamed trail was an easy old grade through a stately hardwood forest with some big vines. Cliffs rose above us to the right. The grade was obvious with a slight incline as it wrapped around the mountain and entered the glen of High Rock Run. Down in the glen was a falls and grotto I never noticed before. We crossed High Rock Run and passed a campsite, which brought us to the Loyalsock Trail (LT), where we turned left. The LT descended high above High Rock Run, taking us through hemlocks and between rocks before High Rock Vista. We left the LT and took the High Rock Trail down to PA 154 and the state park. This loop was about 4-5 miles. These are two great loops that you need to check out the next time you’re at Worlds End. 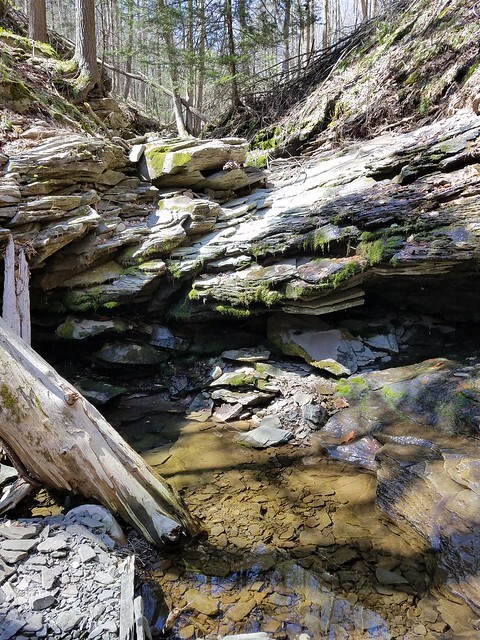 Recently, an isolated gorge in the Loyalsock State Forest interested me. 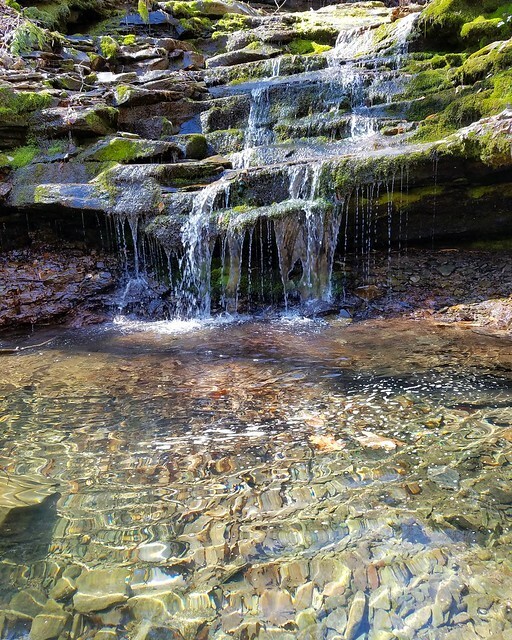 Located east of Bar Bottom Hollow, Big Cove Run tumbles down a gorge and appeared to have several waterfalls. Steep slopes surround the streams. Not knowing what to expect, I decided to check it out. The first issue was which way to go in- the route from Bar Bottom Hollow was longer, but appeared easier. The shorter route from Barbours was undefined, would require crossing the sides of steep slopes and bypassing private property. I decided on the Bar Bottom Hollow approach. I followed the route of my Bar Bottom hike from last year, until I reached a road to the left which climbed up the side of the mountain and passed in front of an isolated cabin. The old road re-entered the woods where I made a left on an unblazed old grade. 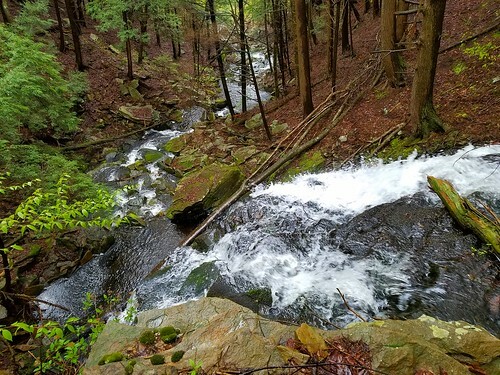 This obvious grade crossed the top of the mountain and proved to be a beautiful hike through expansive hemlock forests. The grade became a little harder to follow, but dropped down into the drainage of Big Cove Run. I was happy to see some water flowing and I left the grade, heading downstream into the deep glen. 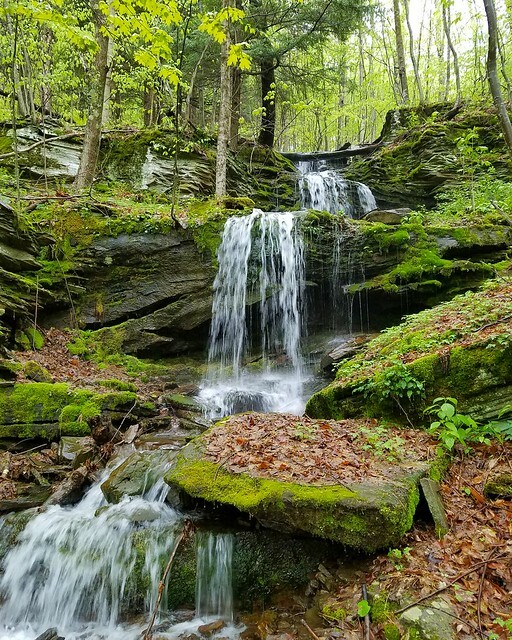 Cascades and waterfalls soon appeared over mossy rocks and under hemlocks. The creek unfortunately disappeared underground. There was damage from the flash floods of last year which may have affected the creeks ability to hold water. I reached two beautiful moss grottos which would hold beautiful waterfalls; now there was only a trickle. 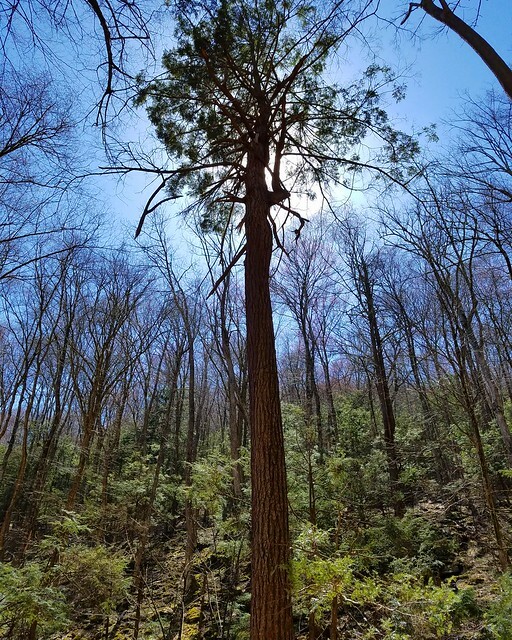 The surrounding forest had many large trees, including some massive hemlocks, which were struggling against the adelgid. From high above I heard the haunting calls of coyotes. I then reached an impressive, multi-tiered falls over a series of bluestone ledges which I called Bluestone Falls. Again, it was a trickle, but when flowing it would be a great falls. A side stream joined with its own falls, again, a trickle. This was the heart of the glen and it was very scenic. The creek then entered a mini-gorge with more cascades. I had to do a little canyoneering; don’t attempt this part in high water. I then reached the top of a 30 foot cascade which had some water. I called it Travis Eberhart Falls after finding a gravestone in his memory on my hike out. Another side stream joined down a steep glen. I hiked up it, but it had no distinct falls. I climbed to any area surrounded by ledges and rocks. Many large ash trees were dying. A nice spot, but not worth the climb if you are looking for waterfalls. From here, it is best to just retrace your steps. While I hiked the north rim of the gorge, there were no views, but there were some good sized ledges. Is Big Cove Run worth the effort? Yes, if there’s water. For some reason, this creek does not hold water well, whether due to the flash floods or it just happened to be dry. This surprised me since smaller creeks were flowing well in other areas of the forest. It should be flowing if the Loyalsock USGS gauge is 5-6 feet or above. 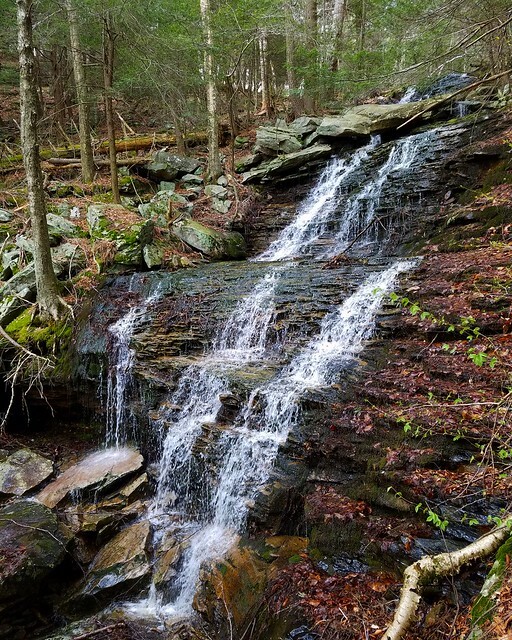 When flowing, Big Cove Run has a beautiful assortment of falls and cascades in an isolated, rugged setting. How to hike to Big Cove Run. Park at the gate of Dad Dad Chapman Road. This gate may be open during hunting season. Hike Dad Dad Chapman Road; be sure to continue straight where the gravel road bends left to a drilling pad. After about 2 miles, reach a logged area with forests of pine and spruce. Turn right onto an obvious grassy old forest road. After about another mile, turn right onto a forest/camp road. Follow for less than a quarter mile, turn left onto a jeep forest road. Follow it as it climbs the mountain. It levels and passes a cabin. The old jeep road re-enters the woods, turn left onto an obvious grade in a hemlock forest. Follow this beautiful trail through hemlocks for roughly a mile. 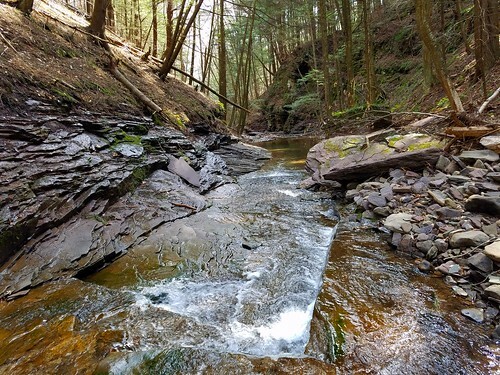 Descend to the headwaters of Big Cove Run and leave the old grade. Follow the creek down into the gorge. Be careful. There are some steep areas. Retrace your steps.